My whimsical invented-narrative paintings are not about beginnings or endings, but rather the middle, the part where the journey is still unfolding, where the adventure is still taking place, where possibilities lie dormant, waiting for an observer, the viewer, to come use their imagination to collapse probabilities into reality (somewhat like Schrodinger's Cat)! Through my work I hope to remind viewers that art can be fun and, in doing so, rekindle some of our lost sense of innocence. 'Self-Portrait with Vandal' - Acrylic & Charcoal, 24"x18"
Vikram Madan was born and raised in India where, despite developing an early love for humor, poetry, art, and cartooning, he ended up becoming (surprise!) an engineer. Arriving in the US for graduate studies, Vikram found himself contributing editorial cartoons to a daily newspaper, which work won him numerous awards from the Society of Professional Journalists, the Washington Press Association and others, and led to inclusion in the seminal 'Best Editorial Cartoons of the Year' collection. Over the years, Vikram's poetry, cartoons and illustrations have appeared sporadically in various publications. 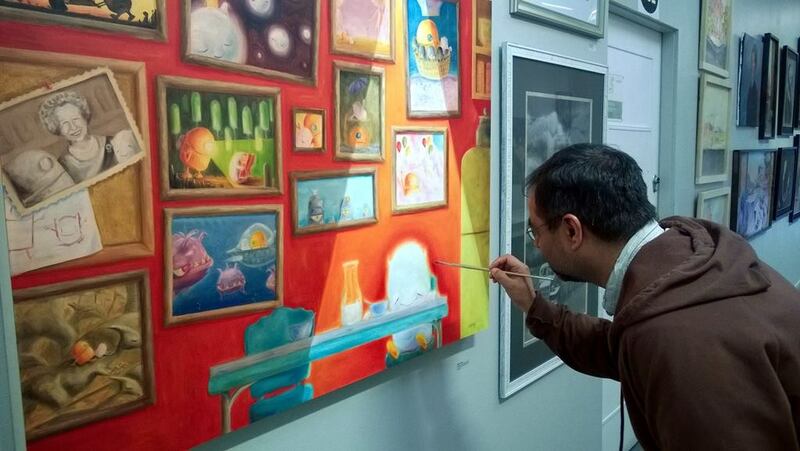 In 2011, Vikram's short humorous film 'The Three Little Space Pigs' was a winner in the Seattle Times 3-Minute Movie contest and was screened at the 2011 Seattle International Film Festival. 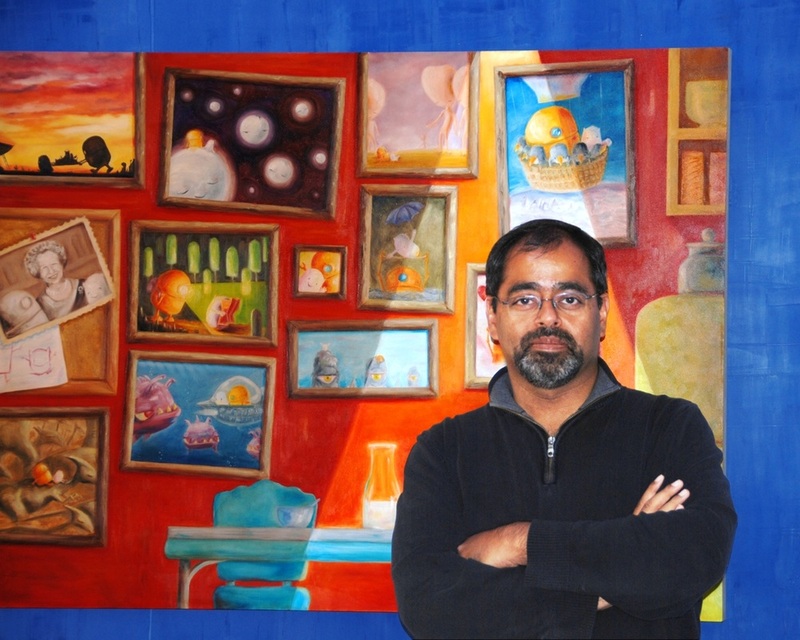 Vikram spent many years working in the Seattle-area hi-tech industry before trading in his keyboard for a paintbrush and a quill, an action precipitated by his first visit to Paris museums, where he was overwhelmed by the beauty of the art, and by a desire to make beautiful art. In 2013, Vikram published his first book, a self-illustrated collection of humorous poetry titled 'The Bubble Collector: Poems & Drawings by Vikram Madan', which is repeatedly compared to the work of Shel Silverstein, won a 2013 Moonbeam Children's Book Award for Poetry, was described by one blog as "The BEST Poetry book of 2013", and has been nominated, by invitation, for the 2014 Washington State Book Awards. 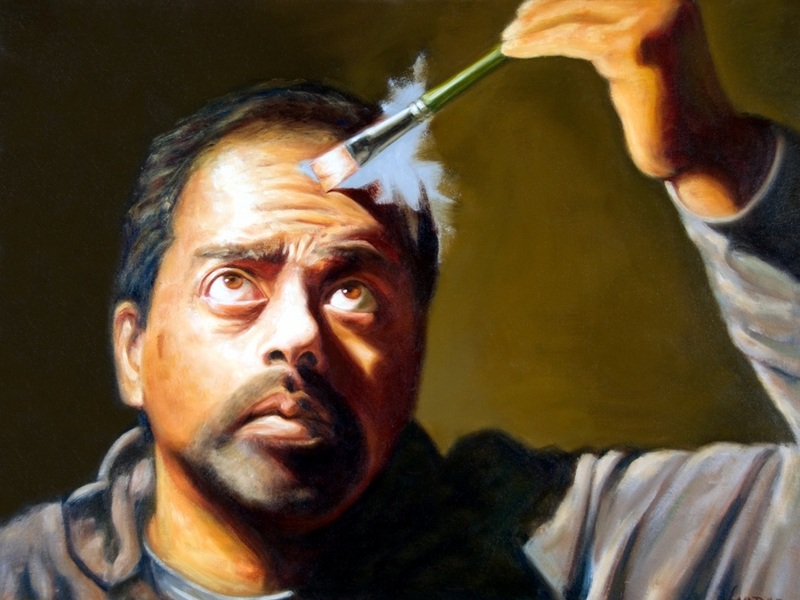 Simultaneously, Vikram spent two years studying drawing and painting full-time at Seattle's Gage Academy of Art, followed by completion of the ArtistTrust EDGE Professional Development Program for Visual Artists. In 2016, Vikram received an Individual Artist Grant from 4Culture. 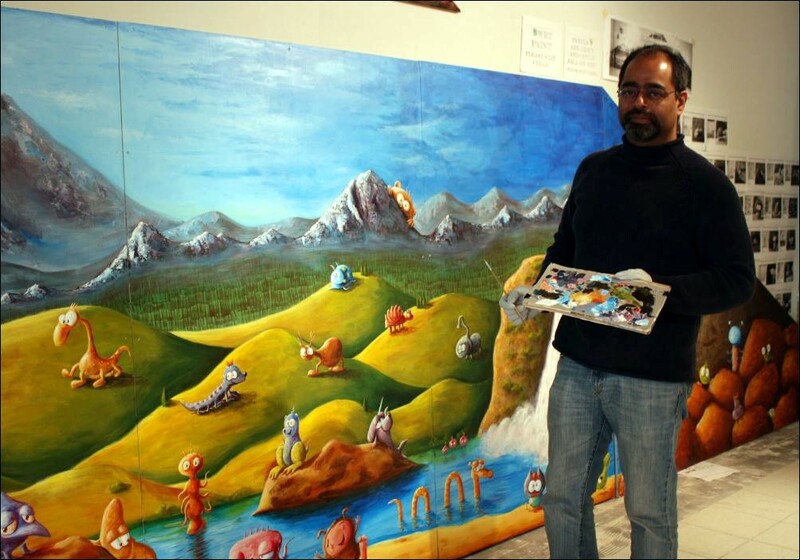 Vikram currently displays his contemporary whimsical art in local shows and galleries all around the Seattle area and enjoys sharing his love for humor, poetry and drawing with kids of all ages by conducting in-person and Skype school visits. He also has several Art Books now available from Amazon.Com. 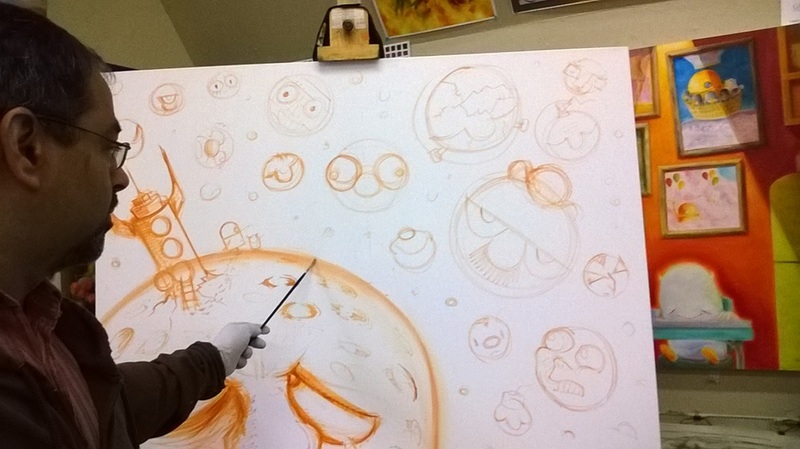 He is a member of the Society of Children's Book Writers and Illustrators (SCBWI) and is represented by Stimola Literary Studio. Vikram's second poetry collection 'Lord of the Bubbles: And Other Funny Poems' was released in Nov. 2018 and a third collection 'A Hatful of Dragons: And 13.8 Billion Other Funny Poems' will be published in 2020 by Boyds Mills Press. At the end of it all, Vikram hopes to create visual and literary art that explores the human condition without taking itself too seriously, that invites audiences to rekindle a lost sense of innocence, and that helps make the world a better place one shared moment of levity at a time. * Read a profile of Vikram's journey here in this 2014 front-page article in the Redmond Reporter. "I Paint, Therefore I Am" - Self Portrait of the Artist as a Work-in-progress.